Varanasi is located on the west bank of the river Ganga as it flows through the north Indian state of Uttar Pradesh. After attaining Nirvana, Buddha came to Varanasi in search of his five disciples. Varanasi is 764 kms. From Delhi and 678 kms. from Kolkata. It is well connected by good metalled roads. Varanasi also has an airport and is a major railway station. One of the oldest living cities of the world, Varanasi is held in high esteem by the Hindu devotees from all over. Once known as 'Kashi' and 'Banaras', the city of spiritual light - Varanasi lies on the banks of the holy river Ganga or the Ganges in Uttar Pradesh. The eternal city, which is rich with its vibrant past is believed to be the favourite place of the Hindu God Shiva, who is supposed to liberate the souls to receive moksha in the city of liberation or moksha - Varanasi. The Kashi Vishwanath Temple : Dedicated to the Hindu God Shiva, the Kashi Vishwanath temple is the one of the major holy shrines for the Hindus in India. Located in a crowded 'Vishwanath' lane, the Vishwanath temple is also known as the 'golden temple' due to the gold plating (1000 kilograms) done on its 15.5 meter high spire, which was donated by Maharaja Ranjit Singh in the year 1839. The temple, which was originally built in the Gupta period around 490 CE, faced many invasions from the Muslim invaders, but was rebuilt in the year 1777 by Rani Ahilyabai of Indore, and since then has maintained its glory. Today, the temple comprises an old Shiva Lingam, an image of the Goddess Annapurna along with other Gods and Goddesses. Besides, the temple also enshrines an image of the God Shiva, whose glimpse or darshan is permitted only twice a year on special festive days. Tulsi Manas Temple : Built in the year 1964, the Tulsi Manas temple is one of the major attractions of Varanasi. The 'white marble' temple, which has been dedicated to the Hindu God Lord Rama and His consort, the Goddess Sita, also reflects an excellent work of art in its interiors. Bharat Mata Temple : Dedicated to the mother India, the Bharat Mata temple is open to people of all the faiths. The temple, which was built by Babu Shiva Prasad Gupt and inaugurated by Mahatma Gandhi in the year 1936, comprises a graven map of undivided India in place of a deity. Banaras Hindu University : Scattered over a vast area of 2,000 acres, the Banaras Hindu University has the privilege of being the largest and the oldest university of north India. The university, which was established in 1916 by Pt. Madan Mohan Malaviya, consists of different faculties such as Arts, Science, Language and Literature, Engineering, Medical, Humanities, Music and others along with a huge Vishwanath temple dedicated to the Lord Shiva. 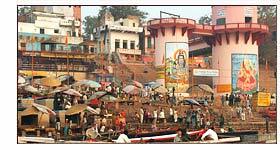 Harishchandra Ghat : Named after the legendary Indian ruler Harischandra - the Satyavadi(one who always speaks the truth), the Harishchandra Ghat is a sacred burning Ghat of Varanasi. Llying on the bank of the holy river Ganga, the Ghat is believed to be the same one where the owner of the Manikarnika Ghat had bought the king Harishchandra as a slave and a caretaker of the Ghat. It was here that Harishchandra's own son Rahul was brought for cremation and he, instead of his dharma had followed his karma by not allowing the cremation unless and until the charges were paid to the Ghat by his wife, Tara. 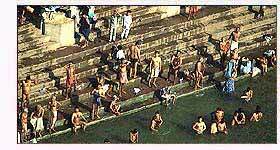 Today also, the Ghat is a revered funeral place for the Hindus. Dasashvamedha Ghat : The most popular Ghat of Varanasi, the Dasashvamedha Ghat is frequently liked and visited by the religious Hindu pilgrims. 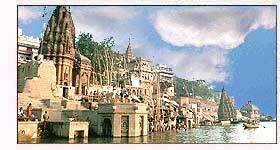 The Ghat, which literally means 'the sacrifice of ten horses', is close to the Kashi Vishwanath temple and also homes a temple of the Goddess Shitala, who is believed to cure her devotees suffering from smallpox and measles. Air - The Babatpur airport, 25 kilometers away, is a domestic airport and well connected with Delhi, Mumbai, Kolkata, Kathmandu and other major cities of India. Rail - The Varanasi railway station is well linked with other important Indian cities directly. Road - Varanasi is located on the National Highway number 2, which links Kolkata to Delhi via Allahabad. 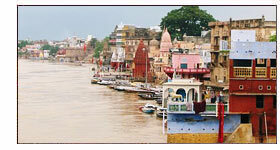 Varanasi can be reached conveniently by a coach, bus or a taxi. Sarnath : Located merely 8 kilometers away from Varanasi, Sarnath is one of the major Buddhist attractions venerated by the Buddhists from all across the globe. It was at Sarnath where the Lord Gautam Buddha after attaining enlightenment had preached His first sermon to His five disciples. A home to numerous Buddhist stupas, monasteries and temples along with the museum, Sarnath is a revered place worth visiting. Kaushambi : A major Buddhist site, Kaushambi, which lies 185 kilometers away from Varanasi, is though in ruins today, but still its importance lies in its years old history. The ancient city of Kaushambi was visited by Lord Gautam Buddha in the sixth and ninth year after He was showered with the divine light of enlightenment. It was due to the Buddha's sermons, that a large section of people at Kaushambi had converted to Buddhism, which further helped in the spread of the Buddhist doctrine. Even today, the ruins of the ancient city speaks of the golden days of Buddhism in India. Vindhyachal : One of the major Shaktipeeths, Vindhyachal is highly revered by the Hindus. Located 80 kilometers from Varanasi, the small hilltop of Vindhyachal is a home to Vindhyavasini Devi temple, Ashtabhuja temple and Kalikhoh temple, all of which have been dedicated to different forms of the Goddess Durga. Ramnagar : A historical village, which lies 14 kilometers away from Varanasi on the other side of the holy river Ganges, Ramnagar is famous for its old fort. The fort, once the residence of the Maharaja(ruler) of Varanasi, now comprises a museum, which displays the royal collection consisting of arms and weapons, old cars, palkies, ivory works and several others. Besides, Ramnagar also houses two major temples for the Hindus - the Chhinnamastika temple and the Durga temple. 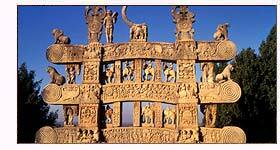 The capital of Kosala Mahajanapada in the ancient times, Sravasti is also known as Sahet-Mahet. During the annual vassavasa, the city hosted the Lord for 25 years ( during the rainy seasons). The presence of Lord Buddha in Sravasti led his Sangha advance to congregate into one place. Sravasti is also renowned for the magical feats showed by Lord Buddha, sitting on a lotus, and for the other many stories that are linked with Buddha. The most popular is the story of the woman who came to resurrect her dead son. There are many other stories, related to Sravasti, basically confirming the supremacy of Lord Buddha and proving him as a legend. Its not known whether these really happened or not but looking at the faith of the local people its hard to believe that these are mere stories and not the truth that happened here. The place also has a magical charm that enlivens tired tourists instantly.